If you are having problems viewing this newsletter it is available online here. - It's Here, It's Here! Our New Aussie Ebook is Here! Please feel free to forward this newsletter to anyone you feel would also benefit from this information. If someone you know has forwarded this newsletter to you, you can subscribe here to make sure you automatically receive future issues. 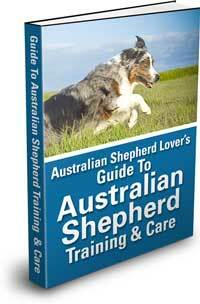 It has taken a lot of work to create the Australian Shepherd Lover's Guide To Australian Shepherd Training & Care but it's finally ready. In addition to all the information I've added over 220 photos so far. I've decided to make it only $17 and that includes all future updates. I'm really excited about the release of this ebook and I'd love to hear what you think. Email me at anton@australian-shepherd-lovers.com with your feedback. Thanks everyone for your encouragement and support over the years. Special thanks to everyone who has been part of our community on the website, forums and Facebook, submitting photos and stories about your Aussies. This ebook wouldn't have been possible without you! Leann shares this photo and story about her Aussie Baxter Blue who has developed epilepsy, but that hasn't stopped him from enjoying agility and spreading joy with his winning personality. Says Leann, "I don't think Baxter has met a person yet that he didn't win over with his Aussie lovin'." If you are considering getting an Aussie (or another Aussie) there are many that are in need of loving homes. We are very excited to celebrate the annual Australian Shepherd Nationals in the great state of Wisconsin, September 16th -24th! The Nationals provide an opportunity for Aussie owners across America to come together to honor the versatile Aussie with herding, obedience, agility, rally, tracking, and conformation events. The Nationals also provide an opportunity for Aussie Rescue and Placement Helpline, Inc., (a 501c3 organization) volunteers, past and future adopters, as well as our generous sponsors to come together and work towards a common goal - help save Aussies in need! ARPH volunteers across America work in concert to provide homeless, abandoned, lost and the forgotten Australian Shepherds with refuge, food, love and medical care. Our organization appreciates any and all donations in order to continue our good works. We will host a booth throughout the Australian Shepherd Nationals and are requesting your support. We greatly appreciate our past donors and look forward to welcoming any new supporters of the ARPH family. ARPH accepts monetary donations as well as any items we may use for raffles, gift baskets or sales in our booth! Our organization would love to meet, greet and thank you personally, so we urge you to come out to the event to join our team of compassionate volunteers. Please join us so you can show your support, sign up as a volunteer, or become a foster home to help save more aussie lives! Please feel free to contact JoAnn with any questions at: joannhawkinson@gmail.com or 815-690-5280. Please feel free to drop off donations at the booth! You will receive a receipt for your tax deductible donations. In closing, all ARPH volunteers and rescue AUSSIES would like to extend our warmest thank you for any and all donations that you provide in order to allow us to continue our efforts to save as many of our beloved Australian Shepherds as possible! This beautiful photo from Patricia Costa from Lisbon, Portugal is of her Australian Shepherd Loki enjoying a day at the beach showing off an incredible merle coat. "Understanding your dog and knowing how to control him, develop his potentials, and resolve behavior problems, emotional conflicts and frustrations are no less essential than love and respect." Hope You Are Enjoying The Aussie Weekly! Haven't Subscribed Yet? Why Not Give It a Try? Let me know what you think of The Aussie Weekly. Contact me here with your feedback. Every week you will get a new edition featuring... the BEST Australian Shepherd Photos submitted by readers like you, Product Highlights for dog owners, Cartoons by Mark Anderson, Dog Quotes and the feature photo will also be available as an Online Puzzle (great for kids and Aussie fans of any age). Hope you like it! Subscribe to The Aussie Weekly Today! It's a little Aussie fun in your Inbox every week. It's completely f'ree and you can unsubscribe anytime. If you haven't joined yet I'd like to invite you to visit http://www.facebook.com/AustralianShepherdLovers and click on "Like" at the top of the page to become a member of our Facebook page. Australian-Shepherd-Lovers.com is Powered by Site Build It! We've added a site blog to let you know about new additions and updates to our site. Of course this newsletter is a great way to stay informed but now you don't have to wait for our next edition to come out. You can check our blog page anytime: We didn't stop there. We also added an RSS/XML feed of our site blog. Now you can easily subscribe to our feed and get our updates delivered to your RSS reader, My Yahoo!, My MSN or your Google Personalized Home Page. If you have a website please add a link to our site from yours. You can also find other relevant websites you can share links with at Value Exchange. Value Exchange, helps you find high-value, similarly themed sites. "The World's ONLY True-Blue, Real Link Exchanger that WORKS!" 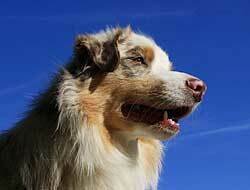 © 2007 Australian-Shepherd-Lovers.com. All Rights Reserved. the legal rights of any person or entity will be removed promptly upon notification.